Toppling Goliath is making me want to pack up and move to Decorah, IA! After another great event and fun-filled weekend in Decorah, it’s pretty safe to say that Toppling Goliath (www.tgbrews.com) is becoming a midwest power in craft beer. Along with being able to hit up the brewery a couple of times, my wife and I got to spend an evening in Decorah checking out local businesses and eating some really good food. We rolled into Decorah around 5 p.m. and I was just itching for a TG brew, so we headed right to the brewery with the intention of only having 1 beer and then grabbing a bite to eat. Well, after a pseudoSue for me and a rover truck for my wife, I went back to the bar and was going to buy some bombers of Sue, when all of a sudden I saw!…… a beautiful tap handle that can make your mouth water and your legs quiver….that’s right, Mornin’ Delight was just getting tapped! Now, the intent was to have one a go, but when you see something this rare and delicious being tapped in front of you, you must stay and enjoy….. so we did. The deliciousness of this beer has not been overstated at all; breakfast in a bottle folks, all the elements. When we finally left the taproom we checked into our hotel, Hotel Winneshiek. 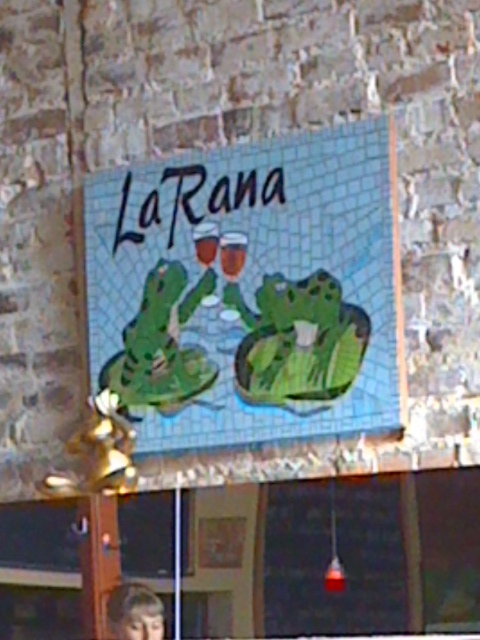 (www.hotelwinn.com) My wife had read something about the best cook in Decorah being at a restaurant called La Rana. We had a really great meal there and they also had Toppling Goliath on tap. Highly recommend checking this place out on your next visit to Decorah as the burger was phenomenal! In the morning, we had breakfast at T-Bocks which really impressed me because of them using local eggs, cheese, and meat. Really enjoyable breakfast, and we actually went back for lunch. My one complaint, if I have any, is that they don’t make their own ranch dressing, it’s hidden valley, but oh well. We were also able to check out the co-op downtown which was really impressive! Great food options and also not a bad beer selection either. Anyway, we got to the brewery for the Kentucky Brunch release at 7:45 and the people! OH THE PEOPLE! I couldn’t believe the amount for an 8:00 a.m opening! It just goes to show when you have a class act for a business the people are going to flock to you. I got sticker #12o something, and was hoping to get a taste of the Kentucky Brunch, but they were calling out by numbers and only got to the 90s before the keg went dry. Damn! Lesson learned though, get their earlier! As we waited we enjoyed some great brews, talked with some great people, and just enjoyed the day. As we got in line to get our beer it was great to see Clark from Toppling Goliath personally greeting everyone as they left. People from St. Louis, Minneapolis, Indiana, etc. had made the trek for this beer and I am very grateful I was able to get my hands on one! If you are a craft beer lover, you have to take some time this summer and get to Decorah, the craft beer capital of Iowa! Sierra Nevada Hoptimum has Arrived…..Finally! !